Over time the ancient people of The Liberean Pennisula formed the three nations of Neon, Lastile and Cavarrvo. They were partially isolated into three valleys by two unfordable rivers. These nations established trade routes with others through gaps in the northern mountains and plateaus. The trade amounted to very little as they all produced similar goods. With the development of steel weapons and stone castles this idyllic existance begin to change. Abundant iron mines, timber and quarries could be found in the north. This led to minor skirmishes and quarrels over these valuable resources. Neon resented the fact that it was the smallest in size. Lastile while the largest was nervous about having a potential enemy on each side. Cavarro's arable land was limited by The Coastal Mountains. They also felt their access to the plateau and its quarries was more difficult than the others. Thus the stage was set for what came to be known as THE TRIPARTITE WAR. The war began with a fight between Neon and Lastile over iron mines. This could have been just a minor skirmish but Cavarro sensing an opportunity attacked Lastile over some disputed quarries. Lastile at first was at a diadvantage having to fight on two fronts but----- The lecturer stood and stated, "We know almost nothing of this period of our history. This is the only known document fragment to come to modern times. During the time of troubles we lost almost all historical knowlege. No one knows who won the war. It is a great mystery. Students your assignment, as budding historians, is to use modern game theory and computer modeling to determine the outcome of THE TRIPARTITE WAR. Oh yes this assignment will count for a third of your grade." The map looks spectacular Von Kamstra!! Your maps are really something. The minimap really takes one back. Thanks for the comment Surajsubba. Coming from one of the best map makers in Crusaders it is real compliment. 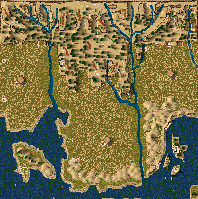 One of the purposes of the map was to force all the fighting to the top of the screen where it is easily seen by the player. is this a school assignment that you did on crusader and got a grade? No, I envisaged a college professor using an old parchment fragment to pose a problem for his class. It would be nice if you had a teacher cool enough for this type of assignment. I was never that lucky. I played the map against Saladin & the Wolf. Had no problems concerning sudden deaths of lords nor incompletion of castles and the like. This actually happened to be one of the longest game i played primarily coz the only route happened to be a small gap in the plateus. Great playability by the way. I'm amazed by your imagination for maps. This map clearly shows the originality of the map. And u sure come up with great stories to fit it. The map design was fantastic too. Placing most iron on hilltops created a rush. a single stone mine had to hav more than just a couple of ox tethers. i went hunting to pass the time while stone/iron piled up. You make good maps Vonkamstra. i also noticed that u seem to make very different maps from the rest and hav an artistic signature design. I really enjoyed the map.One of the best crusader maps i'v played in weeks! Excellent job! Surajsubba, thank you for the review. I have a BS in geology and geography and I try very hard to make maps where the geography could actually exist or give an explanation of why the feature is present. You and a handfull of others do a much better job when it comes to using the computer for special effects than I can. I just use what I know. AS always a quality map,multplayer games would be best with this map,(i really like the mountains) and the idea of them being the only way to the enemy creatin multiple chokepoints.